"Twenty years ago, the demoness Urgoroth rose to power from the depths of the Temple of the Abyssal Winds. She was defeated, but your parents were lost in the conflict. Your aunt and uncle have raised you in the small village of Tomm's Crossing, where life has been mostly peaceful. Until now…"
So begins the classic-style role-playing game Temple of the Abyssal Winds. Single player, controlling a band of adventurers. Real-time pauseable combat for realism and control. A combination of open-ended exploration and strong story driven plot. Tactically challenging encounters featuring many different strategies. Deep, complex role-playing system, inspired by popular paper-and-pencil role playing games. Dozens of quests, enemies, and monsters to tackle. Build the character you want to - dozens of skills and powers, and hundreds of spells and items. Try the first chapter for free, which includes a full adventure and conclusion. If you like what you see, chapter 2 is available for purchase, with the following chapters 3 through 6 to come in 2015. Merry Prankster Games invites you into the world of Temple of the Abyssal Winds! 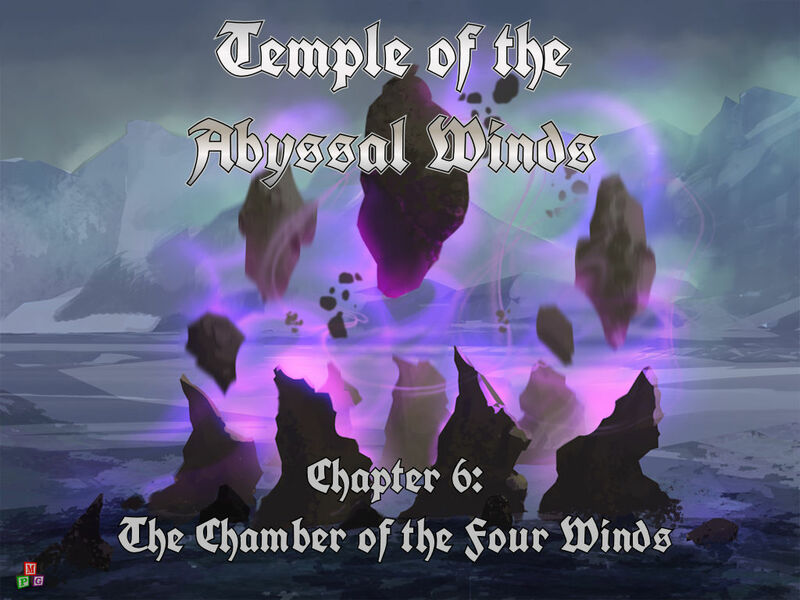 Temple of the Abyssal Winds is now complete, with all 6 chapters available for Windows and iPad! The release of Chapter 5: The Caverns of the Four Winds, and Chapter 6: The Chamber of the Four Winds, brings to a conclusion the full adventure. At last, confront the demoness Urgoroth in the very nucleus of her power, the Chamber of the Four Winds. Defeat her, and free the Timberhills from her threat once and for all; fail, and she is sure to rise again. Conclude your adventure in the classic-style role-playing game of Temple of the Abyssal Winds. All 6 chapters are now available, with the release of Chapter 5: The Caverns of the Four Winds, and Chapter 6: The Chamber of the Four Winds. On Windows, visit the website to purchase chapters 5 and 6, and on iPad, purchase chapters 5 and 6 as in-app purchases. If you are new to Temple of the Abyssal Winds, chapter 1 is free to download and play for both platforms. Start there, and then move through chapters 2 through 6, concluding with your confrontation of the demoness herself. Merry Prankster Games invites you into the world of Temple of the Abyssal Winds! Merry Prankster Games is a one-man band indie development studio, started in 1995 making the play-by-email game Atlantis. For more information about Merry Prankster Games visit: Prankster.com or email Geoff Dunbar at totaw@prankster.com.